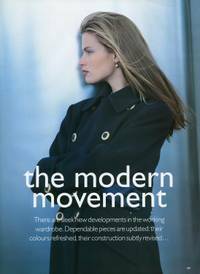 "The modern movement" by Neil Kirk. Scanned by PhilA (Bellazon forum) - since I was lazy to do that and his scans are amazing! "Artful dodgers" by Arthur Elgort. Models: Christy Turlington and ? "More dash than cash" by Patrick Andersson. From article about skin health. My scans of beautiful Helena Christensen! And from the article about Tatjana Patitz and her movie debut. My scan! I'm not sure about the photographer in these 2 last posts, I believe it says somewhere in issue! And last editorial is also scanned by PhilA (Bellazon forum) - lazy me! 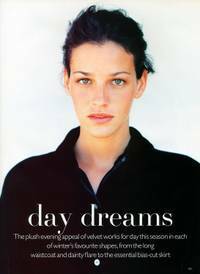 "Day dreams" by Robert Erdmann. Models: Tereza Maxova & Shiraz Tal. BTW,is there any couture ed in this issue? Great post but the last image doesn't have a link. Any chance you could fix it? oh your nickname is great! what does 岩野真衣 mean in english? I love Kristen's Lagerfeld ads. And Stephanie's Versace ad is great too. This is a great issue. Thanks for the scans. 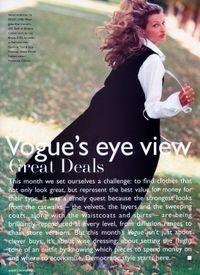 But there are 2 more editorials; Cover story with model known to me (as I seen her before but don't know the name) and Tinker tailoring with Helena, Nadja, Kate and some others. I will scan them in the next few days! MissIvana, thank you for your wonderful scans. They are such nice quality. The Russell & Brown ad still shows grain structure, and it hasn't been smoothed over, and so on. Really nice job! Thank you!!! I think that is a great ad! Who is the model? It's Amber Valletta. Thanks Steve! "Cover story" by Mikael Jansson. "Tinker tailoring" by Paolo Roversi. Models: Helena Christensen, Nadja Auermann, Kate Moss and ?